Last summer, Sharon Leon and I (Sheila Brennan) led a team at RRCHNM with the challenging goal of increasing capacity within the fields of history and art history for doing digital work. We started with novices and invited them to learn with us for two weeks last summer. At the end, those digital novices transformed into ambassadors who are engaging with the growing community of digital humanities practitioners and who serve as advocates supporting digital history and digital art history work at their institutions and in the fields at large. Recent studies conducted by Ithaka S+R document how historians and art historians are reluctant to engage in digital methods and to integrate those methods and related tools into their teaching. The cycle perpetuates itself as these established scholars are then unable to mentor graduate students or even to point them to appropriate training opportunities. These same scholars may also dissuade junior colleagues from pursuing digital work. Even as digital work is receiving increasing recognition in academic circles, one major question remains for faculty interested in digital humanities and in new publishing mediums: will it count? Despite decades of amazing work in digital humanities, the skills and methods that are central to pursuing this kind of work have only just begun to penetrate the larger community of historians and art historians. This lack of understanding digital humanities methods and projects then makes it difficult for those scholars to review digital projects, at any stage, for professional journals or for a colleague’s promotion and tenure dossier, never mind advising students interested in pursuing digital work themselves. Throughout its 20 years, RRCHNM has organized and taught hundreds of workshops on a variety of topics and tools to many different audiences. We have learned that short workshops aren’t enough to transform attitudes and approaches to the scholarly enterprise. For established scholars, who are experts in their fields of study, novices in all things digital, and who may doubt the scholarly rigor involved in digital work, finding training that meets them at their skill level and addresses their disciplinary habits and concerns can be a challenge. In 2014, Sharon and I organized two summer institutes and crafted curricula to help address these issues. Re-Building the Portfolio ran in July and served 24 art historians, funded by a Getty Foundation grant. Doing Digital History ran in August and served 23 American historians funded by a National Endowment for the Humanities grant. We framed the daily work by grounding it in the latest digital humanities readings, and then applied what they read in hands-on tutorials that let them test different tools that enabled different kinds of digital humanities work. We offered breadth and also provided each participant with the building blocks for advancing their own digital research projects and developing digitally-inflected pedagogy. When we started each institute, all 47 of the participants were anxious. Most worried about falling behind on the coursework, getting lost in the daily tutorials, feeling confused, and that they would be the only ones feeling this way. Participants discovered they weren’t alone in their fears and that they had a new community of colleagues with whom they could rely on for support. Each participant established their own domains, installed open-source software, blogged, planned new learning activities for their students, and began rethinking their research projects. If you’re interested in seeing the daily work, see the schedule or download the curricula for Doing Digital History and ReBuilding the Portfolio. At the beginning of each institute, we did not know how participants would respond to the intensity of the two-week curriculum. We measured progress in two major ways. First, during the institute we surveyed participants a few times to gauge the pacing and instruction, and we adjusted schedules and our approaches accordingly (ie, allowing more time to discuss the readings in the morning sessions). Second, to measure the overall effectiveness of the entire curriculum to change attitudes and practices of the participants, we crafted a pre-institute survey that asked four questions related to our goals and asked the same four questions at the end. In the post-institute survey, we also asked more typical questions following workshops, about overall satisfaction, if participants felt their voices were heard, and if their personal learning needs were addressed. Do you feel comfortable presenting or discussing digital history or digital art history work with your colleagues? Do you feel comfortable supervising students who want to use digital tools in their history or art history scholarship? To our delight, 100% of Doing Digital History and ReBuilding the Portfolio participants responded that the institute faculty and facilitators improved their understanding of digital humanities and digital history or digital art history. All participants left as confident digital ambassadors with a todo list, new skills, insights, and motivation to pursue digital work and become active participants in the growing community of digital humanists. The largest positive growth we saw was in the number of individuals saying that they are comfortable reviewing digital projects for scholarly impact in promotion cases, which we see as a real intervention in effecting change in academic culture and practices. The cohort of art historians began their institute more comfortable than the historians discussing digital work with their colleagues and in their ability to review a digital project for a professional journal. The largest area of growth for the art historians was in reviewing for promotion. At the beginning of the institute, only 35% of the cohort felt confident and by the end the total increased to 76%. 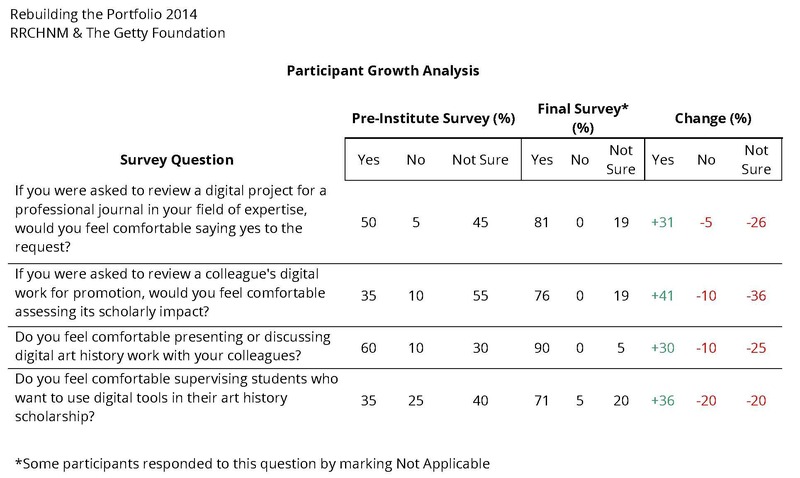 As a group, the art historians were less confident than their historian colleagues in their ability to supervise or mentor students using digital tools. At the end of the institute, 36% were more comfortable advising, with many more unsure than not. The historians began less confident in their ability to review and discuss digital work than their art historian colleagues. At the start, only 26% responded that they were comfortable assessing digital projects for scholarly content in promotion cases and 74% were not sure. At the end of the institute, the percentages were almost reversed with 79% feeling comfortable reviewing and only 21% remained unsure. We saw a 53% positive growth rate. Across the four categories, we saw a remarkable shift in confidence as not a single historian answered “no” to any of the questions at the end of the institute. By inviting 47 historians and art historians to engage with digital humanities theory and practice, they were able to better re-examine their own professional assumptions and naturalized processes to see that scholarly production can take many forms. Through analysis of existing projects and through building some things from scratch with their own sources, participants learned how to read, analyze, and interact with digital scholarship. Based the numbers of applicants for both institutes, and separate inquiries, we see there remains a substantial unmet need for beginner DH training that also addresses disciplinary needs. We heard anecdotally from participants that some felt that other outlets for DH training didn’t address their needs as historians and art historians. Even scholars working at institutions with a DH presence found it difficult to get training beyond tools workshops. Also, a few felt like they weren’t prepared to take deep dives into specific digital humanities methods or tools offered by other DH workshops. After taking our summer institutes, however, they felt much more prepared to pursue other types of training. Even with all expenses covered, everyone cannot afford to leave their institutions, families, and lives for two weeks. We have been asked about preparing an institute that is shorter, and even longer. We think that two weeks is the optimal amount of time for an introduction to the broad field of practice that is digital humanities, while diving into disciplinary-specific projects. This time allows for participants to be removed from their existing structures and commitments long enough to immerse themselves, experiment, and see the possibilities for changing their research, teaching, and professional practices. Running an institute for two weeks also requires a big commitment from the host institution and requires a strong team (ReBuilding Team, DoingDH Team). While Sharon and I led each day, RRCHNM research faculty and visiting instructors helped to shape some individual days of instruction. We also relied on a solid crew of four graduate teaching assistants who led tutorials, provided one-on-one assistance, responded to the backchannel discussions, and updated the institute’s online schedule to reflect any new sites or tools mentioned during the day making the course websites invaluable resources. The logistics of coordinating an institute are not easy and we couldn’t have pulled everything off without the dedication of Jeny Martinez, the RRCHNM office manager. Additionally for each of the two-week institutes, Sharon and I were unavailable for other project work at the Center. Unlike other academic units, the Center operates on a 12-month calendar. Even with all of these challenges, we enjoyed focusing on one project at a time, teaching as a team, and getting to know our awesome participants. Some may ask why we aren’t charging for training. We have in the past on a very limited basis. But, we prefer to offer affordable training opportunities that are open to a wide audience, because it aligns with the Center’s mission to democratize history and humanities work. To offer free training, we applied for grants. We have been lucky to receive support from the Getty Foundation and the National Endowment for the Humanities, who are committed to funding training programs for novices in digital humanities. This summer, we are developing an institute for art history graduate students, Building a Digital Portfolio, funded by the Getty. We hope to have other opportunities in the future to offer additional institutes for historians and art historians. If we do, we will be sure to announce them on the RRCHNM blog and circulate the news on social media.